When it comes to celebrating the magic and sparkle of the holidays with friends and loved ones, there’s no place like the Disneyland Resort where, now through Jan. 3, 2010, the holidays shine more brightly than ever. This holiday season, guests will get to see and meet the newest Disney princess, Tiana, the star of a new show in New Orleans Square at Disneyland Park. In addition, they will enjoy the return of special holiday versions of “it’s a small world” and Haunted Mansion, along with beautiful holiday décor, “A Christmas Fantasy” parade and a nightly snowfall on Main Street, U.S.A.
With so much to celebrate this season, the Disneyland Resort is offering expanded park hours and special savings on vacation packages on selected days. For a preview of the holiday entertainment, along with games, video and special offers, visit www.disneyland.com/holidays. For the first time during the holidays, guests in Disneyland Park will see “Tiana’s Showboat Jubilee!” – inspired by the new Walt Disney Pictures animated film “The Princess and the Frog.” The rousing, colorful show has a jazz-filled holiday celebration vibe. It begins with a Mardi Gras-style cavalcade from New Orleans Square to the Mark Twain Riverboat in Frontierland. At the landing, Princess Tiana, Prince Naveen and other “Princess and the Frog” characters move onboard and, as the boat takes to the river, Tiana and company entertain guests on shore with a musical show that includes songs from the motion picture. The show runs through Jan. 3, 2010. Themed entertainment, sparkling decorations and tasty treats add festive warmth to holiday fun at both Disneyland and Disney’s California Adventure park. 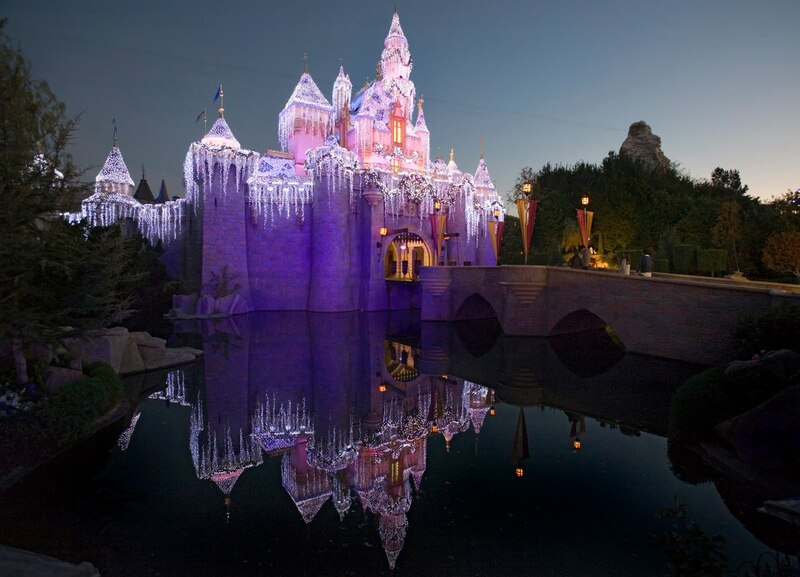 At Disneyland Park, Sleeping Beauty Castle has been transformed into Sleeping Beauty’s Winter Castle where, after dark, a sensational holiday lighting and special-effects show carries the magic of the holidays from the castle all the way to the Christmas tree in Town Square. The Disneyland Christmas tree is specially designed to present a nightly holiday light show like no other, with more than 62,000 energy-efficient LED lights. The finale of the Sleeping Beauty’s Winter Castle show includes the legendary “Believe … in Holiday Magic” fireworks, which take guests on a journey of sights and sounds of the season and ends with a touching rendition of “White Christmas” along with a climactic snowfall swirling down on Main Street, U.S.A., “it’s a small world” Mall and New Orleans Square. Guests also will be able to book a guided holiday tour, “Holiday Time at Disneyland Park,” that provides entry into the “it’s a small world” holiday and Haunted Mansion Holiday, reserved seating for the Disneyland “A Christmas Fantasy” parade, a keepsake remembrance, a sweet surprise and entertaining information about the history behind Disneyland holiday traditions. For information, guests can visit Disneyland City Hall, Tour Gardens Kiosk in Disneyland Park, the Guest Relations Lobby at Disney’s California Adventure Park, or call 714/781-4400. "it’s a small world” holiday transforms the iconic attraction into a worldwide celebration of the season. It also boasts more than 300,000 glittering lights on the “it’s a small world” facade. Haunted Mansion Holiday presents a madcap celebration as the traditions of Halloween and Christmas collide. The ghoulish but well-meaning Jack Skellington from the Tim Burton film “The Nightmare Before Christmas” has come to the Haunted Mansion to transform it with his skewed vision of the holidays. A few new characters have been added to “A Christmas Fantasy” parade, presented daily through Jan. 3, on Main Street, U.S.A. This ever-popular procession depicts an enchanting collection of holiday scenes, music and a cast of Disney characters and performers in yuletide vignettes. Santa Claus and his reindeer return to greet Disneyland guests at “Santa’s Reindeer Round-up” in Big Thunder Ranch. Kids and their families will chat with St. Nick and see real reindeer grazing in a corral. Disney’s California Adventure park celebrates the season with its own fanciful park-wide decorations and lively entertainment. Guests approaching the park immediately get in the holiday mood as they encounter the iconic “CALIFORNIA” letters transformed to appear as swirling red and white peppermint sticks. The holiday scene along the Paradise Bay boardwalk includes a beautifully decorated Christmas tree. Beside it stands “Santa’s Seaside Pavilion,” a quaint Victorian gazebo where, through Dec. 24, guests will find Santa Claus dressed in his most dapper Victorian holiday attire. The ever-popular “Disney’s Electrical Parade” will be presented nightly at the height of the holiday season, Dec. 18 through Jan. 3, 2010. As always, on Dec. 31, both Disneyland and Disney’s California Adventure park will celebrate the arrival of the New Year with special fireworks, noisemakers, music, dancing and extended park hours, all included with regular park admission. The Downtown Disney district and the Disneyland Resort hotels will join in the merriment with twinkling lights and ornaments, special entertainment and holiday dining. For more information about holidays at the Disneyland Resort, visit www.disneyland.com/holidays. The Disneyland Resort features two theme parks – Disneyland (the original Disney theme park) and Disney’s California Adventure park – plus the Downtown Disney District comprised of unique dining, entertainment and shopping experiences. The Resort’s three hotels are the luxurious, newly expanded 948-room Disney’s Grand Californian Hotel & Spa, the magical 970-room Disneyland Hotel and the 481-room Disney’s Paradise Pier Hotel with its “day-at-the-beach” fun. For information on new attractions and vacations at Disneyland Resort visit www.disneyland.com, call (866) 60-DISNEY or contact local travel agents.